True Value is the second largest retailer-owned cooperative in the home improvement industry and therewith one of the world’s largest. 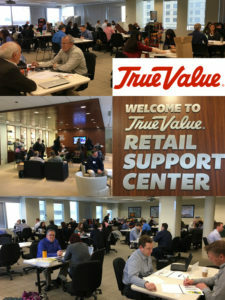 With 13 regional distribution centers serving 4500 stores in over 60 countries and approximately 2,500 True Value Associates, True Value’s retail sales in their communities total about $5.5 billion. -> If you are not selling to True Value this is your opportunity to meet with them!